Soft, sweet, and feminine, this classic A-line gown features a strapless sweetheart neckline, flowy tulle skirt, and a dreamy layer of sequined tulle for a touch of sparkle mixed with intricate lace. If you haven’t found your “something blue” for your big day, at least it’ll be in the name. Blue by Enzoani is a truly captivating collection that flaunts modern wedding dresses for brides who love intricate detail. 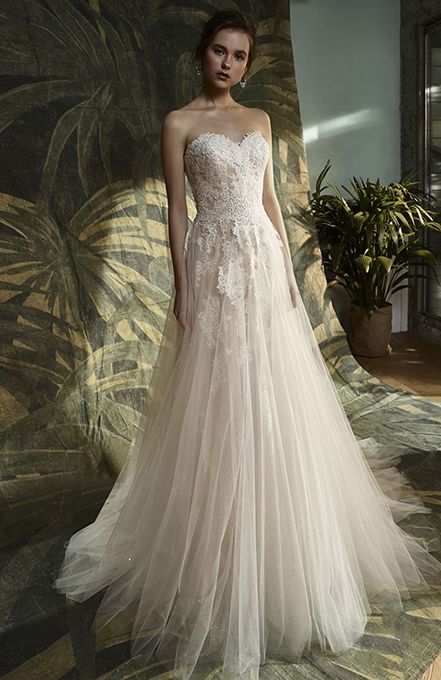 Blue by Enzoani was founded in 2007, and Creative Director Kang Chun Lin continues to design a line that expertly complements the flagship label Enzoani. The meticulously crafted dresses offer a high-quality fit and flattering finish you won’t find elsewhere. The gorgeous gowns embody sophistication through stunning styles and exquisite embellishments. Think crystal buttons, Chantilly lace and beautiful beading; the contemporary wedding dresses from Blue by Enzoani are everything a modern bride could want, and more. Browse our luxury collection of contemporary wedding day dresses and find your dream gown. You’ll fall head over heels for Blue by Enzoani: a collection that perfectly marries modernity and sophistication.